Fit one pie crust into a 9-inch pie plate. 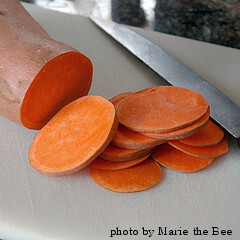 Cut cooked sweet potatoes in half lengthwise and then cut into thin slices. Place potatoes in a large bowl. Add apples, lemon juice, 1/2 cup white sugar, brown sugar, flour, cinnamon, nutmeg and allspice. Toss to coat. Spoon apple and potato mixture into the pastry shell. Sprinkle butter over the apples and potatoes. Cover the pie with remaining pie crust and seal the edges. Cut several slits to allow steam to escape. Use a pastry brush to brush egg onto the top pie crust. Sprinkle remaining tablespoon white sugar over the crust. Bake for 40-45 minutes, or until top is golden brown and juices are bubbly. Let cool on cooling rack at least an hour before slicing. Cut potatoes into long strips resembling french fries. Place in bowl and cover with ice water. Let sit 1 hour. Heat oil to 375 degrees F. Use a deep fryer or heat 1 inch oil in a large skillet. Drain potatoes and pat completely dry with towel. Fry potato strips in batches for 2 minutes or until golden brown. Use a slotted spoon to remove potatoes from oil and place on paper towels to drain. Add salt immediately after removing fries from oil. Serve immediately or keep warm in low temp oven for up to 30 minutes. Cut up sweet potatoes and boil in a large pot about 20 minutes or until fork tender. Turn off heat. Drain sweet potatoes and return to pot and let sit 5 minutes until most of the moisture is evaporated. Place potatoes in large bowl and mash completely. Make sure there are no lumps. Stir in butter, milk, salt, cinnamon, eggs and cream cheese. Incorporate all ingredients well. Spoon mixture into a large baking dish that has been lightly buttered. Bake uncovered for 20 minutes. Top with marshmallows and cook casserole under the broiler for 5 minutes, or until browned. Serve warm. Cut sweet potatoes into chunks and boil in a large pot about 20 minutes or until fork tender. Drain potatoes. Return to pot and turn off the heat and let sit 5 minutes until most of the moisture is evaporated. Place potatoes in a large bowl and mash completely, making sure there are no lumps. Beat in orange juice, eggs, orange zest, baking powder, cinnamon and salt. Drop 1 tablespoon of potato mixture at a time onto a baking sheet, like you would with cookie dough. Bake in oven for 25-30 minutes, or until slightly browned. Serve warm. Place flour, sugar, cinnamon and allspice in a bowl and combine. Using a fork, cut in butter and shortening until mixture is crumbled. Add sweet potato and buttermilk. Stir until barely moistened. Place dough on floured surface and knead 3 times. Using a rolling pin, roll dough to 1/2 thickness and cut with a biscuit cutter. Place biscuits on an ungreased baking sheet and brush the tops with melted butter. Bake for 12 minutes, or until lightly brown. Makes 8 biscuits. Toast pecans and coconut in a dry skillet. In a large bowl, sift together flour, baking powder, salt, cinnamon and nutmeg. Add in toasted coconut and pecans. In a separate bowl, combine mashed sweet potatoes, eggs, milk and melted butter. Mix thoroughly. Combine sweet potato mixture with flour mixture and stir until dry ingredients are moistened.